This spring saw the first death from measles in the United States in 12 years. Measles infections there are at their highest since the disease was supposedly eradicated. The reason for this is that the number of people vaccinated against measles has been falling. More and more parents have been refusing to immunise their children. The influence of a loose group of fringe campaigners against immunisation - "anti-vaxxers", as they're known - has been spreading. And with it, disease. Vaccines can cause adverse reactions in a small number of people, like many medicines, but the accepted science is that the benefits far outweigh the risks. And that's why none of our expert witnesses this week is an anti-vaxxer. Instead we're asking why, given the body of scientific evidence and the advice of national and global health authorities, has childhood immunisation become so controversial? What's behind the anti-vax movement? Four key players in the story share their thoughts. Dr Dyan Hes doesn't accept any patients at her children's clinic in New York who aren't up-to-date with their vaccinations. "I make a promise to my patients that I will do my best to keep their children healthy. So if I have a patient that has cancer or leukaemia or any type of immunosuppressive illness and they sit in my waiting room and somebody comes in with measles and my patient dies, then I didn't keep my oath. That's how I feel. "You need a population to be immunised to protect the people who cannot be immunised." If the vast majority of people in a community have had their vaccination against a disease, and then someone turns up from out of town carrying the disease, it's unlikely they'll come into contact with anyone it can pass on to. The disease won't spread. And especially vulnerable people, who can't be immunised, will be safe. This is called "herd immunity". "Right now in Seattle, Washington, in the United States, 80 to 88% of children are immunised for polio. But you need a 95% rate of polio immunisation to keep up herd immunity. So polio can theoretically re-emerge in Seattle, Washington because there are so many people who are not being immunised at this time." The first successful vaccine was the smallpox vaccine, developed in the late 1700s. But ironically it's the success of childhood immunisation programmes which has in part started the backlash against them. Dr Hes says parents don't see the point in taking action against a disease they've never known anyone to suffer from. "They don't see that so they don't know, so they say, 'What's the big deal? It's a rash, you know, it won't be my kid.' But people forget what childhood death is and what infantile mortality is, people forget how many children died or were left with encephalitis or terrible brain diseases that caused mental retardation and people to be institutionalised for the rest of their life from measles." Brian Deer is an investigative journalist for the British newspaper The Sunday Times. "There was a paper published in February 1998 in The Lancet and basically what it said was that there was a group of parents who brought 12 children to a hospital in North London here in England. Those parents said that they gave their child the MMR [measles, mumps and rubella] vaccine and within 14 days, eight of the families said their child had developed the first signs of autism. "And the paper also said these same children had a new kind of inflammatory bowel disease which, taken together, was a new syndrome in children and it set off the most extraordinary public alarm. "When this story broke, very quickly parents started to shun the MMR vaccination. This man, Wakefield, went on television and it was reported at saturation levels, his recommendation that the MMR should be suspended in favour of vaccinating your children with single shots. But many parents just didn't vaccinate their child and we started to see outbreaks of measles. In fact, I had the misfortune to report the first measles death in the UK resulting from this scare. It was an absolute panic and a real public health crisis." But something didn't quite ring true about the story to Brian. He began to take a closer look at the scientist behind the research, Andrew Wakefield. "I went to interview one of the mothers of the children in the research and she told me a story that was completely different to the story that she'd told to participate in the research that led to the 1998 Wakefield paper. It was a different story." Brian Deer found inconsistencies in a number of the paper's case studies and questioned how impartial the research was. The medical authorities began to investigate Andrew Wakefield's research methods. It took years. He was eventually found guilty of serious professional misconduct, and struck off the medical register. The Lancet withdrew the paper. But all this happened 12 years after the study was first published. No scientist has been able to replicate the study's findings. 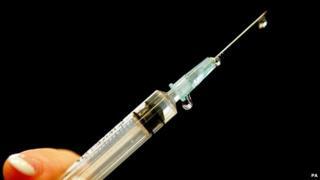 No study has since found any link between the MMR vaccine and autism. And yet the story hasn't gone away. "In the UK the British public is now pretty apprised of the situation. Vaccination uptake levels of MMR have gone back to where they were before Andrew Wakefield's paper, but this story is now rolling out across the world. "I am subject to relentless abuse, emails telling me that how can I sleep at night because of what I've done and that I'm working for the drug industry and that I'm somehow involved in some sort of global conspiracy to harm children." Juniper Russo is a single mother living in the city of Chattanooga in the southern US state of Tennessee, and used to be part of the anti-vax movement. "Andrew Wakefield's study was one of the things that had really scared me. People who are in the anti-vaccine movement largely believe that he was silenced and that he was actually a hero who was speaking up about something important." Juniper now writes a blog, Back From Nature, in which she advocates evidence-based healthcare. Like journalist Brian Deer, she's faced a vicious backlash and even threats from anti-vaxxers for changing her views. But at one time there was no question in her mind: vaccinations were a conspiracy. "I was only 20 when I got pregnant with my daughter and I was really young and really naive and I had gotten wrapped up in this world view that said that nature is just this wonderful thing and that everything about our big scary industrialised world was bad. "I thought that the government wasn't to be trusted and I very much believed in the idea that there was this big organisation called Big Pharma and I thought that people would be willing to make my child sick to make a dollar. "All that I could think about was that I was doing what I needed to do to protect my children from this beast of modern medicine. I didn't think about the possibility that I was putting anyone else in danger, but I now know that I was." But Juniper's views changed after her daughter, who had never had a vaccination, was diagnosed with autism. "That was the beginning of me starting to face that I had made a mistake in assuming that if I did everything in this perfect... way that nothing wrong would ever happen to my kids. "I was seeing a lot of it on the news, and I now realise that it was actually very irresponsible of the media. They would have a physician who worked with the World Health Organization on TV, and then debating with him they would have a mum who said that her kid had autism from the vaccine. "It was very easy for me to side with the person that I could relate to the most, instead of siding with the big scary doctor who was, I assumed, paid off by the government." Heidi Larson, an anthropologist at the London School of Hygiene and Tropical Medicine, has dedicated her career to understanding how people feel about vaccines. "The reason that [people] get more entrenched [in their opposition to vaccination] is they feel like they're not being listened to. So you don't throw information at the problem. Instead you learn to listen. "I do think we need to do a much better job at supporting health workers and health professionals to have difficult conversations. They're absolutely not trained to manage a conversation which is challenging what they do. "It's very much... you get trained as a doctor, a health worker, a nurse, to deliver these good things that are going to help the health of the public, [to] give people the jab. "Additionally there's all this focus on the public understanding the science. I think we're not focusing enough on scientists understanding the public. "We can't keep finger pointing at the public and think they're the issue." The Inquiry is broadcast on the BBC World Service on Tuesdays at 12:05 GMT/13:05 BST. Listen online or download the podcast.